28/29th April saw the Illawarra State Cup held in Unanderra (ie. Wollongong). UTS entered 2 mens team and a women’s Div 1 team (with our Honours women not able to attend). The Honours Men & the Division 1 women came home with gold, while the men’s Div 1 were knocked out in the quarter final. Photos from the weekend will be added in soon along with team updates. Thanks to Bob Cooper and his team for a great tournament. In typical UTS fashion, the tournament started with a lack of sleep and some sore heads as well as the bare minimum in player numbers. In typical UTS fashion, Sunday morning proved to be more of the same. Saturday saw UTS taking on Sydney Uni followed by the second ACT under 23’s. Both proved to be reasonable straight forward wins, amounting to just 70 minutes of volleyball for the day. The early finish meant more time for drinking, and drink they did! Strong start on Saturday vs BHV Brumbies, using Alvin and Igor running through the middle. Our defensive movement on court was not up to speed and a few missed serves led to a loss. Having a 6 hour break before our next game, we decided to utilize the spa/sauna services offered by the hotel. Some quality team bonding ended with a high pitched yelp from all those who decided to jump into the icy swimming pool. Game 2 vs UNSW ( who should have entered honours division), much better performance in the areas we were lacking prior. Taking them by surprise and they had to struggle to win. A few poor ref calls gave them the lead and eventually the game. Ended the day feeling great about our improvement as a team. Sunday started with the same enthusiasm, a few back court swings courtesy Igor who played opposite and more aggressive attacks through the middle and outside, UTS took the game through points countback. Game 2 vs UNSW started very strong, the two teams went at it head-to-head the first set, good strong attacks and defense. UNSW won the game eventually. Overall, marked improvement in team dynamics and communication. Looking forward to State Cup 3 – Newcastle. The Div 1 Girls were out to improve on their performance from Manly Cup a few weeks ago and that we did. After 2 relatively straight forward wins against a U17 ACT side and then Baulkham Hills we came up against a much stronger Sydney Uni outfit in our last game of the day on Saturday. With some great serving from Jessica Ng and some very strong power hitting from our baby of the team, Jesse Jack, we managed to beat them 2-0 and go into the last round match on Sunday undeafeated. On Sunday we accounted for the U17 NSW side 2-0 which put us in the gold medal match against Baulkham Hills. As coach Sam was playing in his own gold medal match, step in super assistant coach, Patti Jack. After a very slow start in the first set we fought back to win the 2nd set but not without contraversy. It seems somehow our 2 middles got out of rotation and swapped positions mid set (not sure how that is possible when playing with a libero?) Anyway set point was then replayed after a very firey Haley decided she had enough and blasted her serve down the line for an ace. At one set all it was time to play the deciding set. Kat Stalmachowski, after her out of rotation debacle decided that she would finally start running her quick attacks back from the net and was unstoppable, hitting winners from everywhere. Added with some very strong outside hitting from the ever experienced Haley Minigle and we found ourselves up 11-4 in the deciding set and poised for victory. Enter the UTS mini choke. Baulkham Hills clawed their way back to 11 all in the set but the choke was not meant to be as we ran out victors 15-12. Congratulations to all the girls for a great solid weekend in Wollongong and to Haley Minigle who received the MVP award for the final. Here’s hoping we can repeat the performance in Newcastle in a few weeks time. UTSSU (University of Technology, Sydney – Sydney University) will be holding team trials for the 2012 Womens AVL Competition. UTS entered a team in all divisions of the recent Manly Cup 2012 held at Warriewood. The men’s and women’s Honours teams brought home the gold. Thanks to Chris Proffitt and his team for a great tournament. There are a heap of pictures from the weekend here – some more tasteful than others. Team reports will be added very shortly as well. The glint of Gold! Outshone only by Michael's shorts. 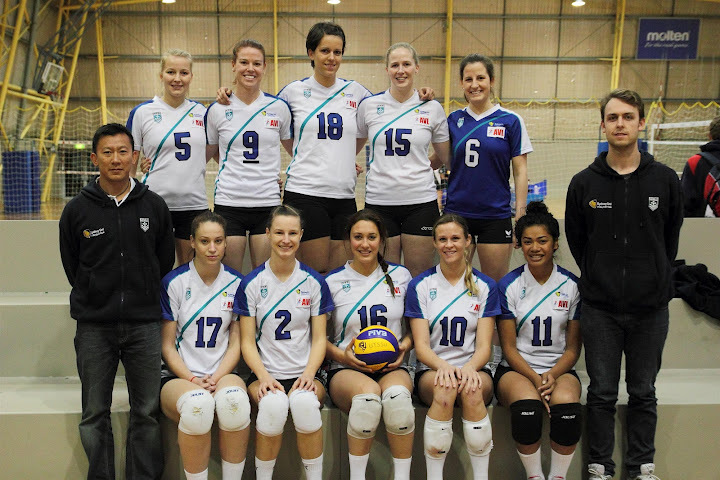 An under-strength UTS side went to Manly Cup, determine to play some good volleyball. Unfortunately on Saturday that did not occur, with the team once again showing that they can play just a bad as any opposition. In the game against the NSW U19’s, a bet was made involving 2 cases of beer and a score-line under 12 in each set. A 25-1 scoreline in the first set (Artem Ipatyev being the disgraced player that gave away a point), followed by 25-12 in the second, saw the UTS coach sweating and tempted to put himself on in order to sabotage the bet. At 12 all in the third set, the coach seemed relaxed and put his jacket back on. Enter the serving of Doug Skinner. At 22-12 the jacket came back off and the sweat re-appeared, but alas, it was short lived as the team made a bunch of errors and the scoreline ended up at 25-20. Day 1 ended with a case of beer and a few laughs and a knowledge that the games on the following day would be much tougher. Day 2 and a 1:00 start, with Marc “I’m a better middle than Luke” Carroll taking the place of his twin brother Luke “I’m a better setter than Marc” Carroll. Brad “Ha Ha…you want me to play middle?” Leesong also made a return as super sub. The semi final against the NSW U23’s saw UTS pitted against a strong opposition for the first time this year. Although the game was tight, UTS had a comfortable win with a 25-17, 25-20 scoreline. The final saw UTS playing UNSW in what was tipped to be the game of the Millenium! UTS with their Russian import, Artem “I don’t need to ask my wife” Ipatyev and UNSW with their 6ft5 German import Martin “ich esse deine kinder” Von Deutschland (who had both amassed 600 points in the lead-up games). The outsides were led by Doug “I used to be able to jump 85 cm – until i got fat” Skinner and Michael “but I am French” Jonstomp. Keith “I am sweaty and I smell” Suckling put in a solid setting performance as usual although he did struggle to find Sam “I’m vice captain and you aren’t” Morrison through the middle (yes Sucky, he does jump higher than you and you do need to set him above the height of the net). Jason “I beat my brother’s team” Laffer showed great improvement though out the weekend where as Nam “why am I playing” Pham did not. UTS Girls Women’s Honors division entered our first competition for the season in Manly cup in Warrierwood Sports Centre over the weekend of 14 – 15th April 2012. Entering this competition, as captain had no idea how we were going to perform as team, we entered to have nothing but fun. First time playing together as team, wasn’t much to expect from the girls to perform at their best. We had some new players from juniors coming up to elite level, new international players and old faces. We had bit of shaky start to the competition with a first game against Hills Dragons losing the first set. We got rid of the cob webs as team and started picking up our game, with win in the second and third set. Girls managed to come back with great defense in the back row. As the day progress we managed to take the win of the next games with great team blocking and defense. By the end of all the games we played on the first day we finished on table 2nd position tied with UNSW and leaders undefeated Sydney Uni girls. Day two we had nothing but sore bodies, that came with aches and pains. For us to reach the finals we need to beat UNSW. 1st set was tight from point to point but we couldn’t secure it with little errors of serving, which cost us the set. As the Second set came we snatched the set off them like piece of cake with end result of 25 – 6 UNSW, with our dominating attack and massive blocks. Come to the final set we snatched the set away and walked away with smiles and massive grin with relief of making the finals 11 – 8 UNSW. Finals were tough as we didn’t win against the Sydney Uni girls in the rounds, as they came undefeated in the competition in our pool. We walked on to court with some wise words from our coach Lionel with his French accent “girls all I want is play with pleasure”. 1st set was win from great serving and team defense from the UTS girls with ending result 25 – 14 Sydney Uni. Last set was final decision maker of who are the champions. It was very tight from point to point from both ends of the court, with all the hard work my girls put nothing but sweat and there bodies on the line UTS took out the final set of 25 – 20. All the hard work that girls have been putting in the trainings we’ve had for the last few months, we still show room for improvement for the next competitions lined up for the year. Awesome talent that the girls showed over the weekend, show why they are in the team. All I can say is I couldn’t ask for better team to captain with great start to the season for our club UTS. Considering they took the gold in the tournament, we gave them a run for the money. Special mention, Alvin’s first ever state cup tournament came to crashing end due to a sprained ankle (my bad – Nith). We fought hard against a stronger UNSW. There was a bit of a struggle with postioning on court which was sorted out towards the end. As a team, we weren’t comfortable with eachother on court, which goes to say that communication prior to serves is essential not during play. We went on to win the game but not convincingly. Although we lost the first two sets, came firing back in set 3, the only difference being the improved intensity and communication on court. Just goes to show that the potential is there but need a bit more consistency. Set 1 started great taking a big 7 point lead aginst the Devils. we lost a few points due to serve reception errors and the Devils caught up. We won the set 26-24. Set 2 was much better, lots of good cover and scrambles to keep the ball alive. A good start to season especially with many new squad members, we have clearly identified the areas that need improvement. Serve reception, improved communication and efficient attacks. Can only get better from here. Going into Manly Cup as Division 1 defending champions, it was apparent this was not going to be repeated after Saturdays day of play. Our first game was against the State U19’s who were fielding what seemed to be half of our UTS honours team. After losing the first 2 sets 25-17 & 25-14, we redeemed ourselves by winning the 3rd set 13-25 hoping this would give us some confidence and momentum going into the next 2 games. Unfortunately, this wasn’t the case as in the second game we went down 3 sets to nil against a very strong United team. The last game of the day saw us going up against the host team Manly. While the Mens Honours team were downing beers on the sidelines, we were in a hard fought battle with last years runners up. At one set a piece it was a more experienced Manly team who prevailed in the end. Sunday was an early start as our team has the first game at 8am. To the coach Sam Morrison’s surprise, everyone turned up on time and found himself with enough players to field a football team warming up. A much improved team performance saw the team record their first win of the weekend against UNSW 3 sets to nil and secure themselves a semi final berth! Once again we went down to the United team 2 sets to nil and then lost the bronze medal playoff to U19’s 2 sets to 1. Overall their was a marked improvement over the weekend with glimpses of brilliance. We have alot to work on and I am sure that coach Sam Morrison will have us all well drilled by SVL start. You are currently browsing the UTSVC blog archives for April, 2012.